Over 50 neighbors attended our first picnic on the new Kingswood Commons. Early in the morning of our picnic, a group of men – headed for many years by Rudy Kagerer – meet to slow-grill chicken halves for the main dish. Neighbors bring potluck salads, sides, and desserts to share. The association provides tables, chairs, drinks, and utensils. Many volunteers organize the plans, menu, decorations, and set-up/clean up. The picnic is on Kingswood Commons at the corner of Lenox & Kings. 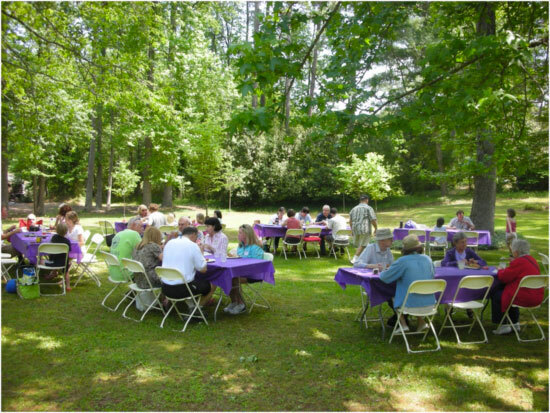 Watch our listserv for notice of our annual picnic, typically held in late April or early May. If you’re new to Kingswood, be sure to come and get to know your neighbors. And, feel free to volunteer. 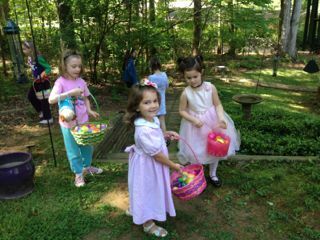 Our Tuxedo Road neighbor, Montgomery Wolf, has picked up the treasured Kingswood tradition of hosting an Easter Egg Hunt. Easter Egg Hunts, an ancient springtime ritual, contain both religious and cultural symbolism, celebrating re-birth and renewal … but for kids, it’s just a colorful, ecstatic time of delight. Traditions and holidays become invaluable when looking back on childhood. Children often remember them as some of the happiest moments of life, even if – in reality – the adults were struggling with the mess of the egg dye, the late night, the early morning, and the sugar high that can last for days. These are simply great memories in the making! 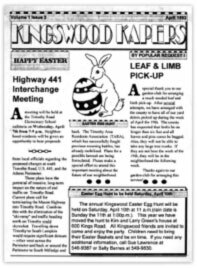 Watch our listserv for an announce­ment and join other Kingswood parents and children for this joyous celebration of spring. 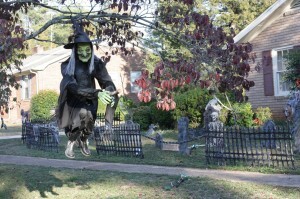 In late October, Mark & Debbie Helwig organize and host a Pre-Trick-Or-Treat potluck event at their Edgewood home. For those don’t know, Mark is a popular fantasy and science fiction illustrator and sculptor, so the Helwigs have great Halloween decorations for this event. Don’t miss it. 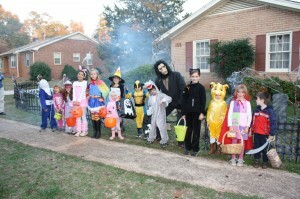 Families with Trick-Or-Treat-aged children (middle school & younger) are invited for potluck snacks and treats, followed by Trick-Or-Treating in the neighborhood. Please bring potluck goodies to share and plan to drop in for snacks & fun starting at 5:30 pm and departing for Trick-Or-Treat at 6:15 pm. Be sure to bring flashlights, reflective tape, reflective vests, etc., as this event continues throughout the neighbor­hood until after dark. Watch the listserv for details. To thank the many police officers and firemen who risk their lives daily to help protect our West Side community, our Edgewood neighbor, Debbie Helwig, conceived the idea of creating holiday treats for our safety professionals. The Care Cookies project has grown into a huge effort involving lots of Kingswood residents and is now several years old. Kingswood thanks Debbie and our Care Cookies team for helping us to thank those who protect us. 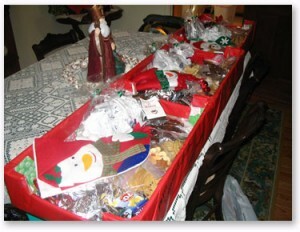 For each of our holiday deliveries, neighbors bake dozens of cookies, cakes, brownies, and more. 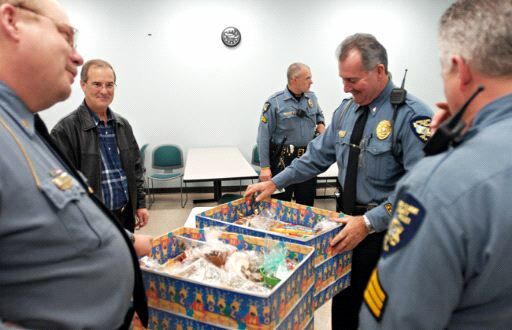 The goodies are packaged separately for each shift at the police and fire departments, where officers appreciate this expression of our gratitude and enjoy the yummy treats. If you have not signed up yet and would like to participate in preparing, organizing, or delivering, please let Debbie know. Your assistance is welcome. Also, if you have friends in the neighborhood who are not part of the email group, please let them know they are welcome too. O Come All Ye Faithful. Come one, come all… to the “Holiday Caroling” sing-along! 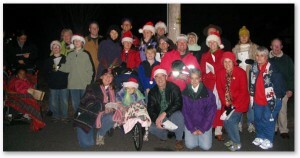 On Christmas Eve Eve at 7PM, we gather at the inter­sec­­tion of Tuxedo Rd and Lenox Rd to fill the neighborhood with music. Bring a flashlight. Past President Pete Barkelew brings Caroling Books. Mark Helwig brings his fabulous operatic voice. Often, Past Past President, Tommy Jordan, brings his guitar. Join us in going from house to house, singing to our neighbors, to ring in the season. It’s a blast! What Else Shall We Do Together? 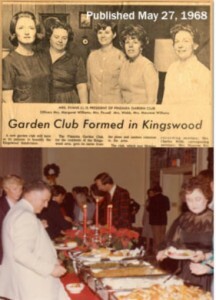 Once upon a time, we had a garden club that held a holiday dinner dance. Some of the original members still live here. But the club and the dance are gone. Once upon a time, Mom welcomed kids home from school with cookies and milk. Now, most households are two-career families, where those cookies have gone the way of the 40-hour work week. Our smart phones hold us hostage 24/7. How shall we find time just to be neighbors together? Times change. As new, young families move in, will they reinvent what “being together” means? We share a terrific neighborhood. What else might we do to strengthen our community? At life’s end, we realize that people are really all that matters. We in Kingswood are surrounded by great neighbors. Let’s discover new ways to enjoy each other.